Germany, 1939 ...our narrator is Death itself and he is telling us the story of a young girl, named Liesel. From the moment she stole a book to the moment she lost another. It's a story about words. The power of words. How they can lift or break someone spirit. How they can manipulate an entire nation, leading to destruction and misery. But also how they can bring solace and hope. It's a story about common folk trying to survive in nazi german. How small acts of kindness could be punished so severely and how good men wanted to do the right thing but were constantly afraid of repercussions and feeling guilty because they couldn't do more. It's a story of a young girl learning to read and finding solace in words. Even if she have to steal them or lets say save a book at a time. A girl that when she read out load, people would listen to her and find solace in her words. A girl that to make you smile brings a snowman to you. It's the story of a young boy with hair with the color of lemons, that first was a thief and then a bread giver.A boy that idealized someone people said he shouldn't, because to him a thing like skin color didn't change no one value. A boy that only asks for a kiss. It's the story of a jew, trying to survive in a world set to destroy him. A fighter that fights for every breath.Living in darkness, he finds the hope in words and in a kindred spirit. And it's also the story of how humankind is able to do the most beautiful things but also the most horrifying things. Death is our narrator and I never thought to say it, but he is quite funny and amusing. But above all a great storyteller in human nature. 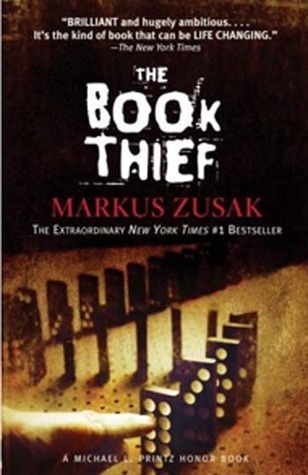 Our book thief and quite a fascinating character. It's her story but also the story of the people in her life, the people she loved. From her determination to learn how to read to how she loved the words, craving for more. In a time where books were burned there was a girl setting on keeping them. They were her most prized possession. This boy made me laugh and cry like crazy.One of the sweetest characters ever. A man with a heart of gold. A musician that could lift everyone up with his songs. A man that kept his promises even when the prize to take was to high. A harsh woman but with a soft heart. She loves and cares deeply even when she doesn't show it all the time. The scene of her at night with an accordion it's hauntingly beautiful. Our fighter. A man fighting for his life just because he is jewish. A man surviving with help of others and feeling guilty for doing it. A man that also finds hope in words. The young man with hair like feathers. Max lifted his head, with great sorrow and great astonishment. This BOOK! This freakin BOOK! I've been wanting to read this one for months now and I was constantly postpone it because I had really high expectations for it and well, I was afraid of being disappointed. That didn't happened has you can see and it was one of the few books that gave me a monumental bookhangover. When I finished, I just laid in my bed thinking about it for a long time and getting extremely emotional about it. Oh yes, I was a mess (sobbing and all that). It's hard to convey in a review all my feelings for this book because I don't want to spoil anything but one thing I can say for sure,this one is truly one of a kind book. And let's just say that even now writing all this down, I feel overwhelmed about it all.